Have you ever said something to someone and wondered how it affected them, their day or others? Have you ever paid for someone’s lunch or something in the drive thru behind you? Have you ever seen the ripple effect in action where one good word/deed affected another person, and then another and another? How does doing good things for others make you feel, even if nobody but you knew about it? Now, what does it feel like to be on the receiving end? Don’t you feel good when one person says something to you or does something for you. Does it change how you feel from that point on? Does it make you want to do good things for others? What about the opposite affect? Similarly… what does one negative thing do to your day? How does it affect your thoughts, your mood or your actions? It’s the same thing but clearly in the wrong direction. 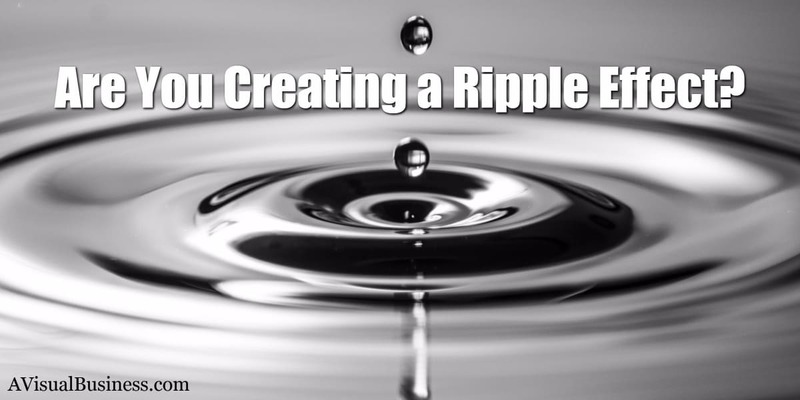 Be sure you are rippling in the correct direction… for the positive! I recently bought a Jeep and well, quite honestly, didn’t do the kind of research that I should have. Now, it isn’t that I don’t like the Jeep because honestly I love it. But, it has been quite a hassle. I bought the Jeep and went on an out of town trip, driving 4 hours to and from and then a few issues came up. So, I contacted my sweet young sales gal, who contacted the service department, who agreed to allow me to come in to take care of some of the issues. I believe, at first they were little apprehensive, but they did what they could to accommodate me, and mostly at their expense. Now, that wasn’t really necessary, because when you buy a used vehicle, it is usually As Is, so it’s on the consumer to be a better consumer….which I wasn’t. So, I made my first service appointment on a Monday and went over my list with them. They explained a few things, since this is a new car to me and a standard which I had been used to an automatic, and took care of some of the other issues. They couldn’t finish one issue due to my time constraints so had to come back the following Monday. That Monday (the 2nd appt) brought up a parts issue, they had to order it and I had to come back which lead to a 3rd Monday appt. At that Monday (3rd appt) it wasn’t that part that was needed but yet another, which led to a 4th and final Monday appt. The weekend before my 4th Monday appointment, I anticipated this would be final (btw, it was, thankfully) so I wanted to do a little something for the service and parts department for all their work, their wonderful customer service and just appreciate them since most of these parts and labor were on their dime. I brought about 2 dozen muffins and wanted to do a FB Live to share it, so I could do a mini-testimonial/appreciation thing on social media. Well, technology failed me.. but I got most of it. They were super surprised and very appreciative! But isn’t that what good businesses do… good customer service all the time?! I am a small business owner so I decided this was a perfect time to do something to appreciate those who appreciate you or who do great things for you. So, even thought technology pooped on my parade, I did get a little something and posted the video with a short excerpt of what happened and what was missed then I tagged that company (Texas Auto) from my business page. I even shared it to my personal Facebook page as well. Again, I made sure to tag the company and within a few hours my business was tagged with a post from Texas Auto thanking me for the rave review and of course the muffins as well. My point again is to be sure that we, as people, and as business owners, are appreciating companies that go the extra mile. This includes people that refer prospects to us, regardless of whether we close the sale or not, as that part is on us. We need to go the extra mile for others when we can, even when nobody is watching. Because in the grand scheme of things, we all know that people will jump to social media to complain, in a heartbeat, but praise less often. Business owners usually have to solicit their customers to get them to write reviews or spread the good news about our businesses so when they come unsolicited… you’d better be sending the love back out. Givers gain.. are you a giver? Do good for others – it will come back to you. Hopefully this has been insightful and encouraging. Should you have any questions, please do let me know in the comments below… or if you have a great review or story, please share! Appreciation is such a marvelous way to be, isn’t it, Kristin. And you know, when you do a good deed, it actually causes your serotonin to rise, making you feel good! That is awesome.. and yes… makes me feel good for sure. It means so much when people recognise your work and show appreciation, Kristen. It can keep you on a high for weeks. To think that you have the power to make others feel that way with a few kind and thankful words is absolutely wonderful and when you do that, it puts you on another high. That is exactly it Tami.. thank you! Great post! Always give without the expectation of reciprocation. Givers always get more back than what they give – even if it’s a feeling of contribution. It’s a good business practice too, some people thrive on just that. You can’t go wrong as a giver. No Cathy.. you can not go wrong with giving! I love this post, Kristen. What you did was so sweet – I’m sure it made their day. It made me feel good just reading about it! A little niceness can go such a long way – it’s a bit of a business super power, isn’t it!? What a great story! You certainly could have responded differently and how great for everyone that you were Appreciative! This motivates me to give today. It’s amazing how we can shift the attitude of those around us just by our words and actions! This is so true Kristen. A lot of people have it rough these days and are trying hard to make ends meet. Anything we can do to show our appreciation, even if it is only a smile or a simple thank you, can make a big difference. Many businesses try to instill the importance of customer service in their employees. When you can show appreciation for that service it makes for makes for better customer service and happier customers. Customer service is huge Joyce.. it’s so easily forgotten! There is certainly not enough appreciation in the world. It makes me feel great when i know i have made someones day with a kind word and equally i know how great i feel when i hear a kind word or a client tells me i’m doing a great job. Exactly Sonya.. and just what I was trying to say too!